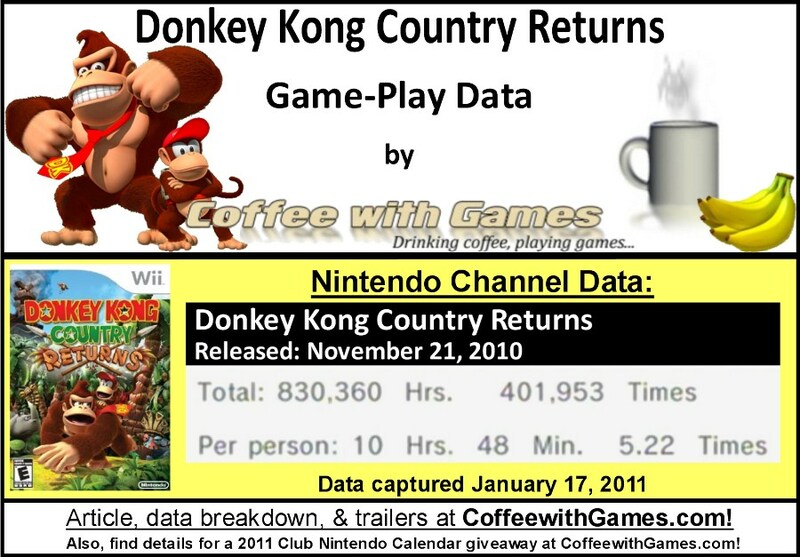 We last looked at Donkey Kong Country Returns' reported game-play hours last month. The game-play hours in the last report were recorded on December 13, so we haven't looked at Donkey Kong Country Returns' game-play hours since before the Christmas and New Year's holidays. If some of you are looking for details on the 2011 Club Nintendo Calendar giveaway, you can check the "Filtered Thoughts" section of this post for the link to the giveaway information. How many hours have Wii owners reported playing Donkey Kong Country Returns in the last 5 weeks? Let's take a look! Hours shown are for the United States of America, not world-wide. 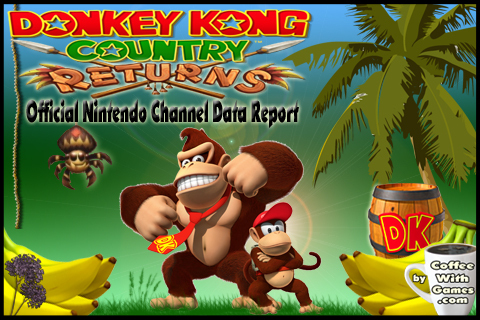 Donkey Kong Country Returns now has 77,002 Wii owners reporting their play-time data through the Nintendo Channel. How many more players have reported game-play data for DKCR in the last 5 weeks? Donkey Kong Country Returns has seen an increase of about 62,358 gamers reporting game-play data, since the last report. Donkey Kong Country Returns now has 830,360 Total Hours of game-play reported, an increase of 689,786 Total Hours of game-play in the last 5 weeks. The average play-time for DKCR is 10 Hours 48 Minutes "Per person" reporting data, which is an increase of 1 Hour 12 Minutes above the average in the last report. The average play-time per session(or day) reported for DKCR is just over 2 Hours 4 Minutes. Donkey Kong Country Returns ' Amazon.com sale rank is #30, and is currently selling for $43.99. Donkey Kong Country Returns' review score average is 87.70%, based on 47 "professional" reviews on GameRankings.com. DKCR has a 4.5 out of 5 Stars rating on Amazon.com, based on 183 customer reviews. You may recall when I mentioned in my "Christmas Gifts & My New Year's Video Game Resolution!" post that I received Donkey Kong Country Returns as a Christmas gift from Mrs. CoffeewithGames. Well, I'm happy to say we have been playing DKCR a good bit, and we are now on World 8. Just like when we played New Super Mario Bros. Wii, there has been some yelling and screaming at the TV[and each other :)], but also cheering when bosses/levels are beaten. As for the data, I think the increase in "Total Hours" and the number of players reporting data, are both very good for the game, and I think both will keep steadily increasing over the next 2 months as more players are completing the game. As for the game's Amazon.com sale rank, seeing it ranking below New Super Mario Bros. Wii and Mario Kart Wii this fast, makes me wonder if it will be like those games for Nintendo and have long sales legs. If you're wondering how DKCR has sold already, it's been reported that Donkey Kong Country Returns has sold over 1.8 copies, though I'm not sure if that number is for North America only, or world-wide; either way, I think it's a great number. Now, I know some of you may be wondering about the 2011 Club Nintendo Contest, and you can find the details for the contest in the "Coffee with Games CONTEST/GIVEAWAY!" post, HERE! Have any of you been playing Donkey Kong Country Returns in the last few weeks? If so, what do you think about the game? I got this for Christmas as well. I've been playing mostly solo though. I've also gotten to the first level of world 8. I found it very difficult, so I'm currently going back and 100%ing the first 7 worlds. Already done through world 4 so far. This game is so much fun. Oh, and I've been co-opping it with my 2 year old, I throw Diddy on my back of course, and she shakes the controller to shoot peanuts. I've found that you can kind of cheat this way. For instance, levels that don't give you Diddy barrels become easier because you always get Diddy back when you die, it just costs you two lives. Also, with two players, you can both equip the heart item, giving you a total of six hits. That little trick got me through the world 7 boss. What's Mrs. Coffee's skill level? I'm just asking, because my wife has the plat forming gene and literally carried me through NSMBWii at some points. Its just uncanny sometimes because she plays so seldom, but is still damn good at certain kinds of games. My wife and I have been enjoying DKCR very much since receiving it for Christmas. Very glad to see that the game seems to be achieving both commercial and critical success! Oh my goodness. Any of the K levels. I couldn't imagine doing any of them without Diddy on my back! "What's Mrs. Coffee's skill level?" I would say Mrs. Coffee's skill level is really, really good...we actually beat the game last night(this morning at 5am! ), and she actually got the final hit(and a few others) on the boss. There were some levels, where I would fall off and die, and she would just keep trucking through it, and complete them. We are about to start right now going back for all the KONG letters. "You definitely need to know when to approach it as 2P and when it's better to just carry Diddy and exploit the jet pack ^_^"
You know, we rarely did this...I can count on one hand how many times we actually joined up. It was usually just both of us running and jumping our way through the levels, and if one of us died, the other would keep going, and look for a barrel...or we would balloon back down depending where the other was in the level. Kind of funny, we all got the game for Christmas, thank you both for the comments! Has anybody else been playing DKCR in the last few weeks? I was supposed to get this for Christmas from a friend in another state (we just confirmed what we wanted over the phone) but ended up not being able to go and just traded his game for the one I wanted, which was Donkey Kong. A lot of fun, and really beautiful and animated. After all the claims about how hard the game is, I was honestly let down with the main game's difficulty. The time-attacks are still hard though, and you'd likely spend more time tackling those than getting the K-O-N-G and puzzle pieces in the levels. i am stuck on the jungle and i just can't get passed the big huge banana eating yellow funny jumping thing and i keep loseing diddy kong cause of that funny jumping yellow banana thing and i just needed one more heart and i could of been on the next part of the island but i lost a heart from the mean big huge yellow banana eating funny jumping monster thing and now i have to redo the whole thing cause i put the super guide on and when my friend which is not my friend anymore she tried to steel my donkey kong country returnes game andwhen she was about to leave,it fell out of her purse and i said "AHA!" and she smerked and i chased her all the way back to her house and thats the last time she's coming over! Save $$$! PS3, Wii, & Xbox 360 Games and more!